The following are detailed specifications about the Beige Empire Lamp Shade with Clip-On Assembly. 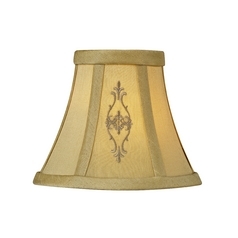 Clip-on empire lamp shade with beige fabric. Top width = 3-inches, bottom width = 6-inches, slope = 5-inches. This clip-on shade fits over a candelabra flame or torpedo shape bulbs only. This shade does not fit over a standard A15, A19, or A21 bulb shape. This Beige Empire Lamp Shade with Clip-On Assembly is part of the $item.xCollectionName Collection from Design Classics Lighting. The following items are also part of the $item.xCollectionName Collection.